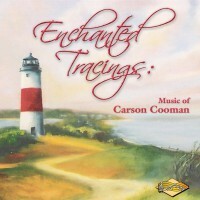 Enchanted Tracings (Piano Concerto No. 2) (2008) for solo piano and wind ensemble was commissioned for a consortium of Donna Amato, piano, the Carnegie Mellon Wind Ensemble, Denis Colwell, conductor; Keith Kirchoff, piano, the Harvard Wind Ensemble, Thomas G. Everett, Mark Olson, conductors; and Nora Skuta, piano, the Slovak Radio Symphony Winds, Kirk Trevor, conductor. These three marvelous piano soloists served as the inspiration for the work. The concerto bears the dedication “for Walter Simmons, a hero for the cause of American music.” Musicologist Walter Simmons has been an inspirational and passionate advocate for serious American concert music for nearly his entire life. Through his tireless efforts as author, critic, record and concert producer, and lecturer, Walter has brought myriad composers and works to much-deserved attention. The basic musical material for the entire work is presented near the outset, the pitches Eb – D – G – Ab – E. This cell is used throughout the rest of the concerto both motivically, in transformation, and as a harmonic structural device. Its harmonic identity creates the mix of tonal/modal and atonal constructs that are a preoccupation of my music. The concerto’s title provided the poetic idea behind the musical development. Though more or less equal with the ensemble in the first movement, the piano clearly takes over as leader in the second and third movements as the goal-directed formal narrative of the movements becomes more obvious. The first movement, Murky Waters, is a free fantasy in which the piano and ensemble “unpack” the musical potential of the basic material. A number of melodic ideas emerge—some lyrical and some disjunct. A brief coda prepares for the next movement. The second movement, The Forgotten, is a lament led by the piano. The harmonic colors of the piano’s sustaining sounds interact with the more linear textures of the winds and brass. The third movement, Casting Infinity, is purposeful and structured as a march with trio. The spiky melodic material is treated in a variety of manners (including very tonally within the trio) before a return of material from the first movement pushes the concerto towards its conclusion.